All the previous issues of tin and copper farthings and halfpennies had been made under licence, or with blanks being subcontracted, rather than by the Royal Mint. Partly because of the profitability of this, they had been overproduced, and there was a glut of them by the time of Queen Anne's accession to the throne in 1702. In addition, Isaac Newton had become the Master of the Mint in December 1699, and held strong beliefs about the future quality of coin production. He believed that the base metal coins should contain their full intrinsic value of pure copper, less only the actual cost of production, that the entire production process should be controlled by the Mint, and that their production should only be sufficient to meet actual demand. On the face of it, these would appear to be very reasonable beliefs, aimed at producing better quality coins at lower cost. Unfortunately, his hopes were somewhat optimistic because the British still did not have the skills or knowledge to produce high quality pure copper blanks. The Swedish were the technological leaders in copper metallurgy at that time. The main, or only, quality control test for the purity of copper was known as the "Hammer Test". A piece of red hot copper was hammered until it was thin. If it split, it had failed the test. We believe that because copper was a relatively new material as far as the Royal Mint was concerned, that they and others at the time, were ignorant of its metallurgy, despite the fact that much earlier civilisations, such as the Romans, has successfully used copper coinage almost two thousand years previously. It would have been much sensible to have used bronze, an alloy of copper, tin and zinc. It is nowadays well understood that alloys usually possess better working properties than pure metals. Because of these factors, no copper halfpennies were ever produced during Queen Anne's reign, although experimental patterns for them were being produced. Similarly, no farthings were produced until 1713, the very last year of her reign. According to Peck, about 400 farthings dated 1713, may have been produced. This was the last year of Anne's reign. It is believed that these farthings were never actually issued for circulation, but were the culmination of a number of patterns produced with the intention of finding an acceptable design. 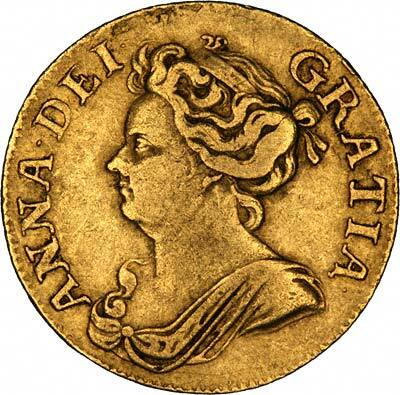 The fact that such a large number of a pattern coin were released may be because it had proved to be acceptable and successful, and that it was about to be produced in larger quantities for circulation at the time of Anne's death. Certainly farthings were issued during most of George I's reign. Anne farthings are certainly a rarity. Our company has only handled 1 example in over 40 years, but then there are many coins about which we could say the same. My guess would be that there are more than 400 in existence, either that or the current catalogue value is too low (2000 Spink Standard Catalogue quotes EF £375, VF £350, and Fine £175). Most specimens which have been offered for sale appear to have been in very good condition, mainly EF (Extremely Fine). Peck comments that the few pieces which show some wear may have been carried in pockets for "good luck". Almost a century after their issue, a strange rumour started involving Queen Anne farthings. This rumour seems to have started in February 1802, and Peck gives a number of examples of press comment and advertisements from the period, from the collection held by the British Museum Coins & Medals Department, in which Anne farthings were offered for sale at astonishingly high prices for the time. Part of the rumour seems to have been that only three examples were made, and that two of these were accounted for. The earliest story tells that a soldier from Chatham was supposed to have received one in his change, been offered £50 for it, refused, then journeyed to London where he sold it for £400. By 1808, the story was still around, and there was a second-hand report of a legal case where an innocent man had been charged with robbery, and the theft of a Queen Anne farthing. The man was acquitted, and it was said that the case was brought by a "pettifogging lawyer, as ignorant as he was villainous" who had suborned a soldier to make a false accusation of robbery, so that the man would be hanged, and the lawyer could get possession of the farthing. Why is it I'm prepared to believe that there may be some grain of truth in that particular story? Every age seems to have its own rumour about coins. In 2000 AD in Britain, it is the famous "£2 Necklet Coin", soon it will be "Silver Pennies Found in Change". Before that it was the "Missing 1933 Penny". Other countries have their own native versions of these silly stories. (You could always let us know yours). The 1713 Anne farthing is very attractively engraved, and would make a pleasant addition to most collections. Don't worry if you can't obtain one, the issues of George and II used the same master punch prepared by John Croker, as did most of the George III issues. It is believed that the figure of Britannia on the many pattern coins of Anne were modelled on the Queen herself. The Britannia used on the actual farthing of 1713 differs considerably from previous patterns produced by Croker, and it is believed that Anne ordered the design to be changed, objecting to the bare leg which Britannia was showing. This would not have been acceptable to the very modest Anne if it were thought that the figure of Britannia was modelled in her likeness. As you can tell by the lack of a photograph, we are looking to buy a choice specimen of the Britannia farthing of Queen Anne, mainly so we can photograph them to help complete this page. The last time we owned one with mint lustre was way before the days of digital cameras, so we do not have a photograph of it.